Stick your hand in your pocket, take out the change you find and put it on your desk. Take a look at all of the coins spread out in front of you. Some of them are probably shiny pennies or dimes, some of them may be well-worn quarters. Some of you, for one reason or another, might even lay out a half-dollar on rare occasion. All of them in various states of age and wear, some of them possibly to the point of being barely discernible. Most likely, however, many of you find a lot of relatively new coinage, minted within the last several years, even though modern money has been printed and minted in this country for decades. Some of it can be attributed to certain pieces of money or notes being removed from circulation. Others can be considered the end result of coin collectors holding them without using them to their once-intended purpose. This latter part is a consequence due to a principle known as Gresham’s law. 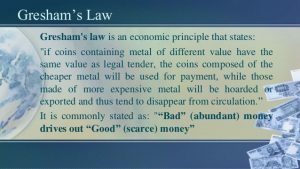 Gresham’s law (not really a law) is a monetary principle that states at its basic level that “bad money will drive out good.” Well, what does that even mean? This principle doesn’t apply itself to counterfeit money. It doesn’t apply to money laundering. And it certainly doesn’t apply to some money taking the moral low ground in a disagreement. Legally speaking, all marked legal tender is worth the same. Every penny (as long as it can be recognized as a penny) is worth one cent, every dime worth ten, and so on and so forth. Nowadays, regarding practical, everyday use, most of us probably don’t even think to consider the actual metallic content of the money we hold as loose change in our pocket. Most of it is made from base metals such as copper, nickel, and zinc with silver and gold completely discontinued as far as general circulation is concerned.